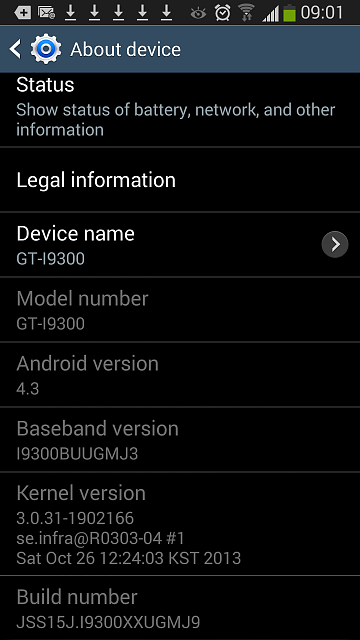 Hi, after yesterday's firmware upgrade (700MB+) my Samsung Galaxy S3 (downloads?) and notifies me about "Download complete" of the same cca 50 files over and over again immediately... After clearing the notifications, the same "Download complete" for cca 50 files appears again and again (no matter what connection I use). Attached is phone's "About" screenshot with many "arrows down" in notification area on top. Please help/advise. Thanks. - while you're in Recovery mode perform a Factory Reset (obviously you'll want to backup anything you care about first). In the meantime you can try going to Settings -> Application manager -> ALL, scroll down until you find the two 'Downloads' apps, Clear cache and Clear data and Force stop for each one, then try restarting the phone. I wished that some app can stop the download processes and clear the cache, so I installed several apps, but no help. Just got off the phone with Sprint. This is a Samsung issue and they are aware of it and if you're getting multiple downloads of the same things PDF's especially, go to your browser and delete your cache. If you have multiple browsers....do this in all of of them. Samsung has pulled the update and is working on a fix that will come shortly. I found the problem wasn't resolved by clearing the cache and data from the Browser, but it seems to have fixed the problem by clearing the cache and data from the Download Manager. It wasn't on the list in the Application Manager, so I had to press and hold on one of the rogue notifications. It popped up a link to App Info. I followed that into the Download Manager and cleared everything in there and turned off notifications. It seems to have solved the problem one way or the other. Your tip appears to have worked on my Galaxy S3 with Android 4.3. Those download notification things have had me going mad! What is your Signal strength of your Cell Network Provider on your N5 in dBm & asu?